"I am a very nervous person that hates needles and he is very patient with me." " Definitely worth visiting if you're looking for a general dentist in Chula Vista." "He takes the time to answer any of your questions & concerns." " just want to say a big THANK YOU to Dr. Guzman for all the procedures he did." "The staff is super friendly very professional and are very thorough with patients." "Great customer service. Family atmosphere. Best dentist in Chula Vista." "Best dentist in San Diego." 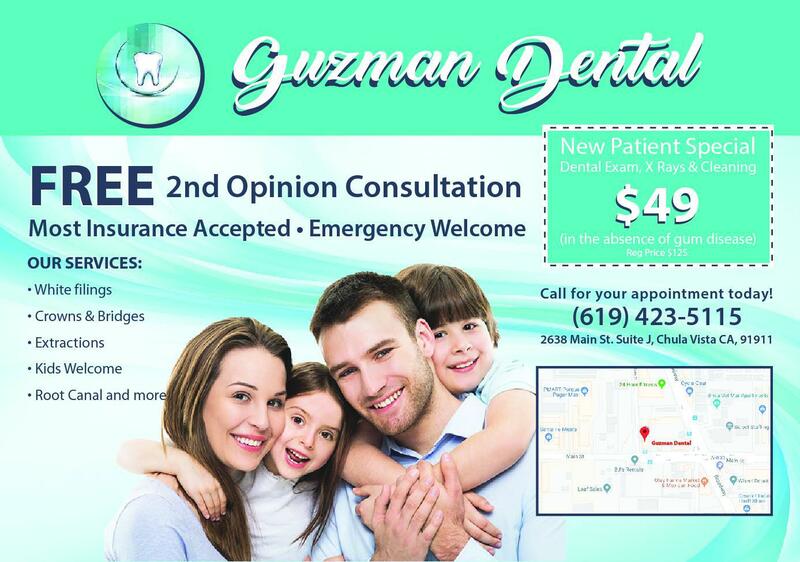 For exceptional dental care in Chula Vista, California, contact Dr. Jose Guzman of Guzman Dental. His compassion and dedication to his patients make him a premier dentist in the South Bay area of San Diego. At Guzman Dental, Dr. Guzman is an expert in both preventive care and restoring mouths and smiles damaged by dental disease or injury. He offers a wide range of dental procedures and treatment for all your oral care needs, including endodontics, regular check-ups and cleanings, oral surgery, orthodontics, restoration with crowns or bridges, and partial or full dentures. As a cosmetic dentist, Dr. Guzman can also transform your teeth with Invisalign® or give you a dazzling white smile with professional teeth whitening. His ultimate goal is to provide you with superior oral care so you can maintain a smile you’re proud to flash. A graduate of the University of Baja California, Dr. Guzman now has more than a decade of dental experience. Married with four children, Dr. Guzman enjoys spending time with his family when not in the office.